PV Powerhouse, Schletter Inc’s online design tool for flush mount roof top systems, now produces stamped structural acceptance letters on demand and allows for commercial-scale design. Schletter, a worldwide leader in photovoltaic mounting systems, announces updates to its online flush mount design tool, PV Powerhouse. Designed to make the program seamless, updates include an automatically-generated stamped structural acceptance letter with every completed design, thermal expansion calculation, and the ability to design larger arrays. Released earlier this year, PV Powerhouse instantly generates a flush mount rooftop PV design based on user provided information including roof type, module dimensions, and mounting area. Within minutes, PV Powerhouse produces project layout information, sample installation drawings, a stamped structural acceptance letter, and a complete parts list. The parts list can then be exported to the company’s eCommerce shopping site for convenient ordering. According to the company, systems ordered online are produced and shipped out within two business days. 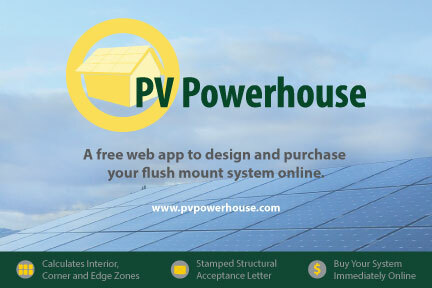 The updated version of PV Powerhouse is now available for use by visiting http://www.pvpowerhouse.com. Schletter (http://www.schletter.us) has designed, developed, and manufactured solar mounting products in the U.S. since 2008, while backed with more than 20-years of solar mounting experience from Schletter GmbH. Since opening its United States facility in Tucson, Arizona, Schletter Inc. has manufactured more than 1 GW of installed PV mounting systems. Schletter Inc. offers products for roof mount and ground mount systems for residential, commercial, and utility scale photovoltaic systems. Schletter Inc. is an independent subsidiary of Schletter GmbH, which operates subsidiaries in eleven countries with more than 1,800 employees worldwide.